Keyuan is also one of the four major Qing gardens in Guangdong. Situated in the city of Dongguan, it was first built in 1850, or the 30th year of the Daoguang Reign. This is a tiny, yet finely designed garden that combines dwellings, parlor, villa, courtyard, flower nursery and study into an integral whole. The garden's 2,000 square meters of space is strewn and studded with 20 or so buildings - pavilions, chambers, halls, waterside kiosks, and surrounding corridor - laid out in such a way that smaller structures are contained in larger ones and that motion is derived from stillness. 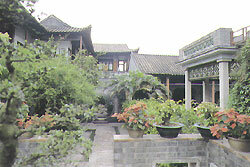 Keyuan is a typical Lingnan garden as well as a fine example among all the gardens in Guangdong.